This rustic sandwich is just the job for a packed lunch on the go. Creamy mayo gets on with creamy avocado like a house on fire. 1 Toast the bread slices and put them aside. Then slice the avocados thinly, season with salt, black pepper, olive oil and chopped coriander. With the tomatoes, cut them into nice, chunky cubes. 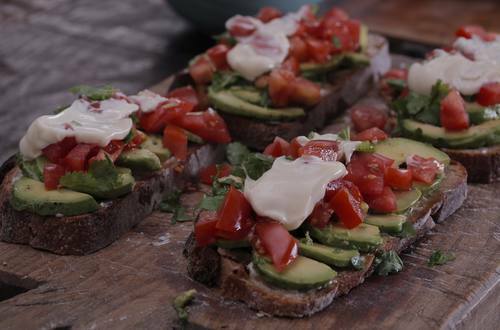 2 Spread a thin layer of mayo on the toasts and on top spread the avocado paste. Garnish with tomatoes and coriander bulbs. 3 Season with olive oil and finish it up with a pinch of salt and a tbps of Hellmann's Real Mayonnaise.